Bullfrog is the common name of the largest North American frog, Lithobates catesbeianus or Rana catesbeiana, a semi-aquatic, heavy-bodied frog native to eastern North America, but introduced into western North America and other countries. While traditionally classified as Rana catesbeiana (ITIS 2006), recent taxonomies place it in the Lithobates genus (Frost 2006a; Frost 2006b). It is in the Ranidae family ("true frogs") of the order Anura . 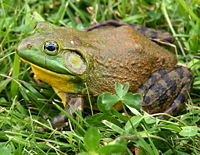 Other large frogs in other species are sometimes called bullfrog and Lithobates catesbeiana is sometimes distinguished as the American bullfrog and North American bullfrog. Bullfrogs contribute ecological, scientific, and nutritional values. Ecologically, they are integral to food chains, both as prey and predator. Bullfrog tadpoles and adults are variously consumed by birds, turtles, water snakes, raccoons, and fish, with the bullfrog egg masses and herbivorous tadpoles particularly heavily consumed by predators. The adult bullfrog in turn consumes insects, annelids, snakes, crustaceans, and eggs, and help in the control of insect pests. Scientifically, frogs are used for medical research, and also serve as laboratory animals for dissection in classrooms. The bullfrog also provides a minor food source. Beyond these values, the bullfrog, with its unique form and behavior, including the low frequency bellow of the male bullfrog adds to the wonder of nature for humans. The bullfrog is native to North America east of the Rockies, from Nova Scotia in southern Canada to central Florida and west to the east coast of Wisconsin and across the Great Plains (Bruening 2002). While some consider northern Mexico as part of the species natural range (Grzimek et al. 2004), Bruening notes that the natural limits are confused by introduction into such places as Mexico. The species has been introduced successfully into western North America, Central and South America, islands in the Caribbean, China, Japan, Thailand, various European countries, and several oceanic islands (Grzimek et al. 2004). In Europe and the western U.S., measures are often taken to control its spread because it competes with, and often drives out, native species. The bullfrog must live in water. Although found in many habitats (lake, pond, river, bog), the bullfrog particularly favors larger bodies of water relative to other frogs (Grzimek et al. 2004) and generally water that is warm, still, and shallow (Bruening 2002). Bullfrogs dig into the mud to hibernate in cold winter weather. 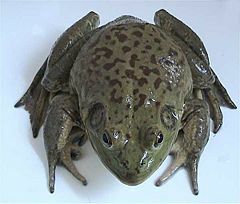 The bullfrog is a large species of the Ranidae family and the largest "true frog" (family Ranidae) in North America It reaches a length of eight inches (203 millimeters) and a weight of up to 3.3 pounds (1.5 kilograms) (Grzimek et al. 2004), and the typical length is from 90 to 152 millimeters. Females are typically larger than males. Bullfrogs are generally varying shades of green, olive, or brown, with dark brown, dark green, or black blotching and a yellow or white underside. The skeleton of an adult frog consists of bone, hyaline cartilage, and calcified cartilage. The calcified cartilage can be found throughout the body of the frog, but it is particularly more noticeable in the epiphyses of the long bones in the limbs and shoulder-girdle. The radius and ulna are fused into a single bone, the radio-ulna, and the tibia and fibula are fused into a single bone, the tibio-fibula. The vertebrae comprise ten bones; nine are true vertebrae, and the rod-shaped urostyle that is almost as long as the other nine. The head of the frog is flat but its form depends on the extensive separation of the jaw bones; the orbital cavities and the horizontal direction of their floor also have an effect on the form of the head. The central nervous system is made up of the spinal cord and the brain, where the spinal cord is a bit smaller than the brain. The peripheral nervous system contains the cranial nerves and spinal nerves. They have four legs, not two hands and two legs as commonly misconceived. Front feet and back feet are both webbed. the hind limbs are long. The bull frog has large talons. The bullfrog uses its skin, buccal cavity, and lungs for respiration. Cutaneous ("skin") gas exchange is very important in all amphibians. The tympanum is relatively large, particularly in males (Grzimek et al. 2004), where it is much larger than the eye; in females, it is as large or smaller than the eye (Bruening 2002). Males also have nuptial pads, and single internal vocal sacs, and a yellow throat in breeding season, in contrast to the white throat of the female (Bruening 2002). The life cycle of bullfrogs, like that of other frogs, consists of the main stages of egg, tadpole, metamorphosis, and adult. The male reproductive organs are the testes and their duct, and the female have ovaries. In the spring the male calls the female from the water. Bullfrogs are aptly named since their call is a loud, guttural bellow that carries a long distance, over one kilometer (Bruening 2002). This loud, low frequency call gives the impression that the frog is much larger than it actually is, which is an advantage in keeping predators away. Males are territorial and aggressive (Grzimek et al. 2004). The female lays up to 25,000 eggs in floating egg masses in the water. The eggs are 1.2 to 1.7 millimeters (0.05-0.07 inches) in diameter and pigmented at one pole (Grzimek et al. 2004). Spotted tadpoles emerge from the egg masses after about four days after fertilization (Bruening 2002). Premetamorphisis which is when the embryo genesis and growth and development occur, during this time the thyroid gland is absent. Prometamorphisis is the period in which the concentration of the endogenous thyroid hormone rises. Metamorphosis is the period when the tadpole's tail shrinks back into the frog's body. Other organs also undergo changes such as the liver and the intestine. The gills are absorbed as well. After metamorphosis, it takes an additional two years to reach sexual maturity (Bruening 2002). The adult frog can live up to 13 years, with the record of an animal in captivity being 16 years. The average bullfrog lives from seven to nine years in the wild (Bruening 2002). Adult bullfrogs eat insects, snakes, annelids, crustaceans, frogs, tadpoles, eggs, and almost anything they can capture, with known cases of bullfrogs eating bats (Bruening 2002). They hunt day and night, using a technique of waiting for the prey to come within the range of their tongue, which they use to bring the prey back into their mouth. Tadpoles largely eat algae and aquatic plants (Bruening 2002). In many cases, fish are averse to eating tadpoles because of a undesirable taste (Bruening 2002). Bullfrogs are important ecologically, scientifically, and as a food source. Ecologically, they are integral to food chains, both as prey and predator, and they help to control insect pests. Scientifically, they are used for medical research, because of similarity between their skeletal, muscle, digestive, and nervous systems with other animals (Bruening 2002). They serve as laboratory animals for dissection in some high school and college classrooms. They are occasionally kept as pets. 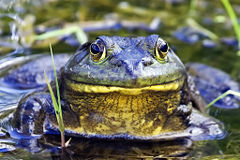 The American Bullfrog provides a minor food source, especially in the Southern United States and in some areas of the Midwestern United States. In a few locations they are commercially cultured in ponds, but the traditional way of hunting them is to paddle or pole silently by canoe or flatboat in streams or swamps at night; when the frog call is heard, a light is shined on the frog to temporarily inhibit it. The frog will not jump into deeper water as long as movement is slow and steady. When close enough, the frog is gigged and brought into the boat. The only parts eaten are the rear legs, which resemble small chicken drumsticks and, sometimes, the backs, and they are usually fried for consumption. Bruening, S. 2002. Rana catesbeiana. Animal Diversity Web. Retrieved October 21, 2007. Frost, D. R. 2006a. Amphibian species of the world: An online reference. American Museum of Natural History. Version 4. Retrieved August 17, 2006. Frost, D. R., et al. 2006b. The amphibian tree of life. Bulletin of the American Museum of Natural History number 297. Issued March 15, 2006. Integrated Taxonomic Information System (ITIS). 2006. Rana catesbeiana Shaw, 1802, Taxonomic Serial No. 173441 . ITIS Report. Retrieved February 6, 2006. Santos-Barrera, G. et al. 2004. Rana catesbiana. The IUCN Red List of Threatened Species. Database entry includes a range map and justification for why this species is of least concern. Retrieved October 21, 2007. This page was last modified on 2 April 2008, at 03:52.